It is always best to call ahead to verify dates and times of all events. The National Gallery of Art hosted a panel discussion and signing to commemorate the publication of the final volume of the series, The Image of the Black in Western Art, Volume V: The Twentieth Century, Part 2: The Rise of Black Artists. Panelists included series General Editor David Bindman and Sharmila Sen of Harvard University Press. The National Gallery of Art hosted a panel discussion to commemorate the publication of the penultimate volume of the series, The Image of the Black in Western Art: The Twentieth Century: The Impact of Africa, Volume 5.1. Panelists included series General Editors David Bindman and Henry Louis Gates, Jr., Sharmila Sen of Harvard University Press, and others. The panel was moderated by Faya Causey, Head of Academic Programs at the National Gallery of Art. Audio from the 90-minute discussion is now available for streaming or free download via SoundCloud. The Du Bois Institute hosted an all-day event to celebrate and discuss the work of the contributors to Volume V: artists working from the Harlem Renaissance to the present day. 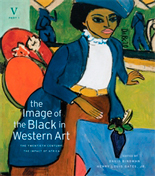 The National Gallery of Art hosted a panel discussion and presentation marking the publication of The Image of the Black in Western Art Volumes 3.2 and 3.3. Panelists included series General Editors David Bindman and Henry Louis Gates, Jr., along with Sharmila Sen of Harvard University Press. The panel was moderated by Faya Causey, Head of Academic Programs at the National Gallery of Art. Audio from the 1-hour discussion is now available for streaming or free download via SoundCloud.